When you need to get around Raleigh, a chauffeured transportation services company is your go-to solution. Here’s what you need to know about hiring a chauffeur for one person or a whole group. Not all transportation companies are cut from the same cloth. For a top-notch ride, look for a service whose qualities set it apart from the pack. We maintain a clean fleet of vehicles. Plus, we keep our vehicles well maintained so you can always count on them to get you reliably from one place to the next. For those times when you need an extra measure of luxury, we have vehicles in our fleet with top-of-the-line features. These include leather seating, televisions, arm rests, and extra leg room. Of course, not every trip requires these bonus features, so we also have more standard vehicles, but even these feature clean cloth seats, climate control, and generous trunk space. Most importantly, we insist on safety as a priority for every one of our vehicles. To join our fleet, a vehicle must meet high standards of passenger protection. Whether you need a ride for one or are searching for a charter bus for your group’s North Carolina travels, we have a vehicle that will work for you. To hire a transportation services company, consider how many people will be in your travel party. For just one or a few people, a sedan or SUV option will fit the bill nicely. A limo can chauffeur your party of up to 10 people with ultimate luxury. Moving on up, there are vans that seat up to 12, mini buses that seat as many as 25, and coaches that hold a whopping 30 people. And, no worries: When we say “bus,” don’t get a vision in your head of a yellow school bus with green plastic bench seats. Our sleek black buses feature individual black seats tailored for adults. Of course, if you aren’t sure which style is best for your needs, give us a call. We’d be happy to talk over the options with you. 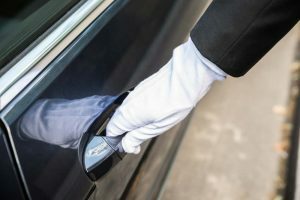 The final step in hiring a chauffeured transportation services company is to book the reservation. To reserve our a vehicle from our elegant fleet, contact us today. We’re available by phone at 919-890-3839. If online reservations are more your thing, that works for us too. You can set up an account and make a reservation on our website’s reservations page. To establish a new account, click “Start Here” on the reservations page and enter your account information. You’ll need to confirm your account by clicking a link in the email that is sent to you. Then, you’re all set to reserve your ride. Enter details about your transportation plans, such as the date, pick-up location, destination, and number of people riding. After selecting a vehicle, you’ll see an estimate of the fee. Just enter your credit card information to hold your reservation.